One of the great benefits of refinishing is we have different color options available. You can change that old avocado green tub to a more modern color. Some of our coatings come in brilliant white and clear but we also have some different color options for tubs & tile. Our urethane hardened paints for cabinet refinishing can often be tinted to the color of your choice. Our countertop coatings come in stock colors but we can also use custom primer colors to create many variations with them as well. We also stock pretinted Bone & Almond colors for tubs. Most home owners purchase previously owned homes that were decorated according to someone else’s preferences. Now you can change that 70’s or 80’s color scheme simply and affordably. Saving up to 90% of the cost of replacement, it really is the most cost effective solution. 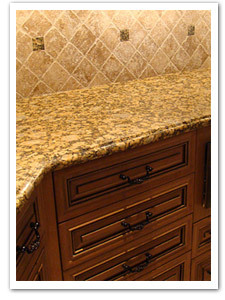 The next time you see that beautiful granite or stone countertop or tile you wish you could afford, get a sample or take a picture because with our faux finishes we can often recreate a similar look for you at a truly affordable price!